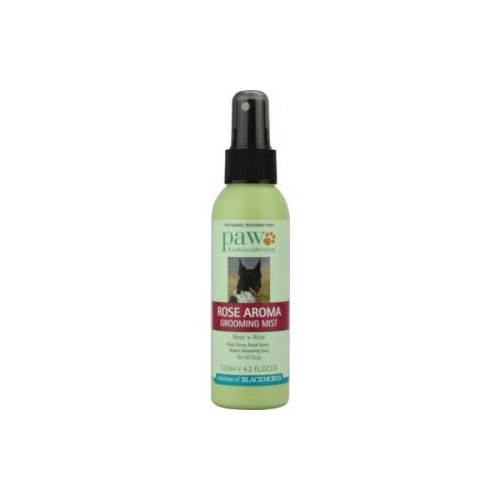 PAW Rose Aroma Grooming Mist is an ideal for pet owners who want easy grooming care for their pet. Richly formulated with rose water, this alcohol free spray gently freshens up the coat between the washes. It greatly strengthens, revitalises and detangles the coat making it smoother and shiner. The key ingredients nourish skin and coat while supplying essential nutrients. Moisturising agents improve coat health and other skin health ingredients add volume and shine to coat. The essential natural oils along with rose water leave dog with a fresh pure refreshing scent. Spray directly onto the coat. Spray it on the wet coat to allow the product to be groomed through the coat, and it will dry in minutes. Gentle on sensitive dog coat. Detangling agents for a smooth coat. Added rose water for refreshing experience. Nourishes skin and coat along with strengthening the hair follicles. Compatible to all types of pet skin. Ingredients Purified water, cetearyl alcohol, glycerin (vegetable), surfactant, avocado oil, jojoba oil, preservative, thickener, vitamin E, rose oil, patchouli oil, Australian sandalwood oil. A great grooming mist that not only nourishes my mate’s skin and coat but also strengthens the hair follicles. I use this grooming care product on my long-haired dogs after showers to moist his dry coat dramatically. This product is very easy to use and gives wonderful results. I am satisfied with my purchase and will definitely purchase this again. I love this it makes Jester's fur quite smooth and soft and it has a really nice smell. In a quick time if you want to give a great look for your dog's fur, I highly recommend this mist. Just great to detangle long hair and makes it easy to manage. For best prices, get it at vetsupply. My four doggies really love the aroma of this mist. They are always happy when I use this to groom them. Perfect one if you want to make your pet feel great.